THE WAY I SEE IT RIGHT NOW, THE SECRET FOR A GOOD RACE IS QUALIFYING. It all began as a chance encounter at a toyshop, when something caught the eye of a young boy. That spark would ignite a desire that was further fuelled by the support at home, leading Singaporean youngster Danial Frost on a path towards motor racing. “My mom built on my passion and from that point I started going to the go-kart track in December 2014 back home in Singapore,” he notes. What started out as a fun-day out, quickly turned serious as a competitive streak began to emerge from the young Singaporean. “Once I started winning and getting better results, not only did I start getting more and more interested, but also more serious.” One day, the topic of the AsiaCup Series came up and the opportunity to test one level up from go-karts to single-seaters. Danial had not just caught the bug, he embraced it with a passion, and one he proudly carries with him on and off the racetrack. In 2016 Danial made the move up to single-seaters, competing in the then newly-formed Formula 4 South East Asia Championship. Right off the bat, the youngster’s competitive nature and determination marked him as amongst the one-to-watch, as fellow rivals, coaches and team personnel all recognised his talent. Through highs and lows in the season, once he dons his helmet, Danial gives his all in the pursuit of success. 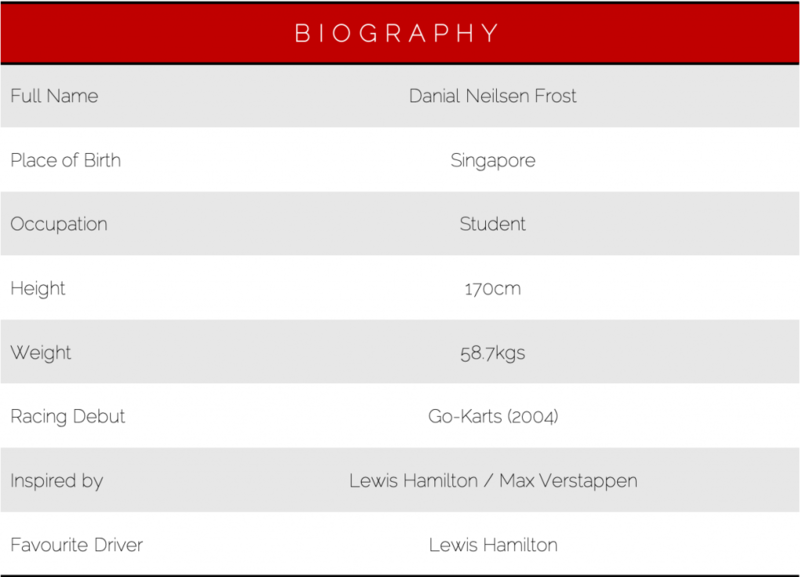 Like all young racing talents, Danial also draws inspiration from the topmost rung of the formula-racing category ladder — Formula 1, ranking the late great legend Ayrton Senna and the Dutch sensation wonder kid Max Verstappen as amongst those who inspires him.